Vote now for King of Sole! In addition to all that fun at Wine Women & Shoes, we will also be naming a new “King of Sole”! The charming Sole Man that raises the most donations through this fundraiser will have the honor of being crowned “King of Sole” during WW&S - and the best part? 100% of the proceeds raised in the King of Sole contest will go directly to Second Harvest to help our neighbors in need! What are the Sole Men? These gentlemen are men from the community who support our cause and mission and volunteer their time and talent to help make Wine Women & Shoes a successful event! Their duties are two fold – Sole Men fundraise prior to the event – this is not only a fundraiser, but a competition to see who will be named “King of Sole”. 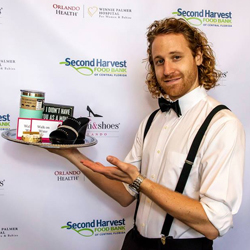 The second Sole Man duty is to volunteer at the event - greeting guests, pouring wine, mingling with guests to show them what our Marketplace vendors have to offer, and tending to our VIP guests during the program portion of the event. It’s a whole lot of fun, and all for a great cause! How can I be a Sole Man?